Janet Kurnatowski is pleased to present Coded. Five Current Shades, an exhibition of paintings by Sara Klar. The gallery is located at 205 Norman Avenue in Greenpoint, Brooklyn and is open Friday through Saturday 1 - 7 pm and Sunday 12 - 6 pm. The exhibition will be on view from February 20 - March 22, 2009. The opening reception for the artist will be from 7 – 9 pm on Friday, February 20, 2009. "Senseless killings of soldiers and citizens in Iraq, profound uncertainties of a presidential election, and the distress of an unraveling financial system" permeate Coded. Five Current Shades, a series of relief paintings created between March 2007 and October 2008. This is a time says Klar, "when anxiety, fear, and despair engaged head-on with beauty, hope and self-determination." Klar's themes reflect the continuing struggle between the desire to control life's journey and the inevitability of life's fundamental impermanence. These conflicts manifest themselves in Klar's painting practice. "Each painting, begun and completed consecutively, is repeatedly resolved then purposefully destroyed when a new painting is applied on top. Acrylic is pooled then gouged with razor blades; paper is glued then abraded and stripped away; pigment is brushed on then intentionally cracked; tape is fastened then torn off." In Coded 1, for example, a glorious red and gold pool of paint is cut by a jagged grey line, as if the seductive flow of life is interrupted by the harshness of the present. Klar, through her extraordinarily inventive process, gives voice to the "quagmires of thoughtful existence." This is Klar's second solo exhibition at Janet Kurnatowski. 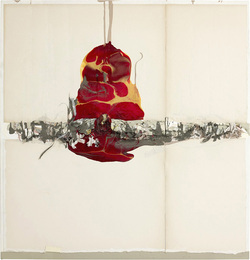 Her work has appeared in numerous group exhibitions in New York galleries, universities and museums including Sideshow, Brooklyn NY; Washington East Gallery, New York City; Hampden Gallery-UMass, Amherst; Marymount College, New York City; The Parrish Art Museum, Southampton NY; and Islip Art Museum, East Islip NY. Sara Klar lives and works in Greenpoint, Brooklyn. For more information or images please contact the gallery.